Luxury and convenience are what Venezia Palm Desert is all about. Venezia Palm Desert is a gated community of beautifully designed homes located at one of the most prestigious addresses in Palm Desert. The neighborhood offers serenity and peace amongst beautiful Italian, Spanish and Tuscan designed homes of various sizes and amenities. The physical location itself offers access to all the components needed to live a full and active lifestyle. This is the perfect setting for the ultimate residence, right in Palm Desert. 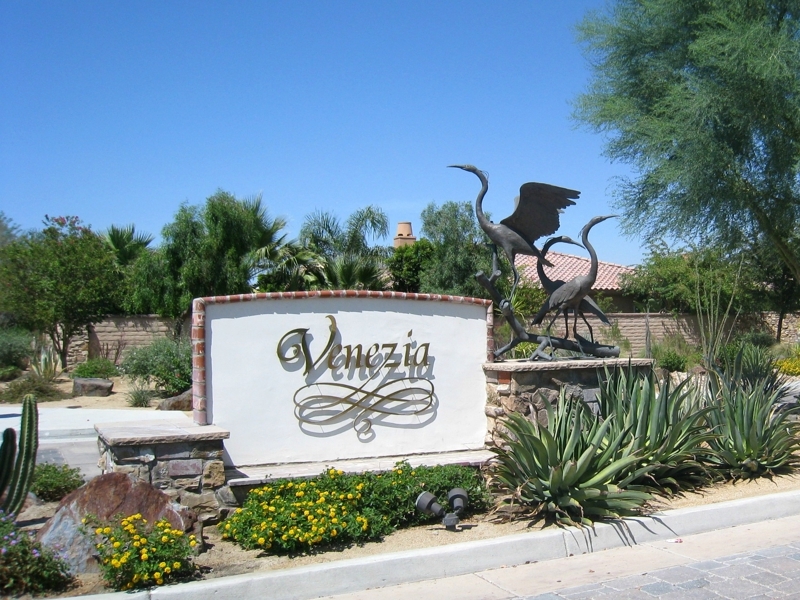 One of the best features of living at Venezia is that the Desert Willow Golf Course is minutes from your home. Here you will find two award winning courses renowned for their beautiful mountain vistas and challenging fairways. Desert Willow was rated 4.5 stars out of 5 in Golf Digest magazine. You are invited to take private lessons, attend clinics and seminars at the new Palm Desert Golf Academy, or just enjoy the camaraderie of your fellow golfers in Desert Willow’s spectacular clubhouse. There’s even a kid’s program for the budding golf pro in your family. And, of course for any supplies you may need; just pay a visit to the pro shop and they will set you up. Every golf day will seem like a vacation at Desert Willow and it’s all right down the street from your lovely home at Venezia. It’s not just the golf that is convenient in this community. Because of its central location, Venezia is close to everything you could need. Palm Desert elementary, middle and high schools are close by, and are considered excellent educationally. All your shopping can be done in the El Paseo shopping district, or if you prefer; the Westfield Shopping Mall where you will find premium retailers of every possible category. All this is within minutes of Venezia. For entertainment, visit the McCallum theatre, or the Living Desert. You will be happy to know, the Eisenhower Medical Center is nearby as well, in case of emergency, or just routine medical appointments. Let’s not forget the weather. Because of its location in Palm Desert, enjoys year round sunshine with less than four inches of rainfall per year, making it the perfect location for year round outside activities. It’s easy to argue that Venezia has a lot to offer; beautiful location and residences, a plethora of available activities, vital social life, and the epitome of convenience. Come have a look for yourself. If you would like to see property at Venezia Palm Desert, please call us at the numbers below. Were committed to helping you find the home of your dreams.